Problems related to pregnancy, childbirth, and motherhood are complex in nature in all societies, more so in patriarchal societies. Infertility is considered as a taboo and life crisis and its consequences can be devastating. The first in vitro baby born in 1978 gave a new hope to infertile couples. IVF treatment can threaten one's future, self-esteem, and intimate relationships. Whenever anyone is threatened or frightened in any way, stress and anxiety are the likely responses. Various research studies have shown that stress and anxiety faced by women undergoing infertility is more compared to men.,, For women, in vitro fertilization (IVF) treatment is psychologically as well as physically very demanding. Anxiety and stress are present in females in varying degrees before, during, and after the IVF procedure. On the day when the treatment begins, women are more concerned about the number of injections they will have to take, the kind of diet they need to follow for better result, the amount of physical pain they will have to undergo, and above all the success rate of the IVF cycle. During the follow-up scans, they are worried about the progress of their treatment. On the day of ovum pick-up as well as embryo transfer, they are anxious to know about the quality and quantity of eggs and embryos, respectively. Women have reported the 2 weeks waiting period after the embryo transfer till they get their pregnancy result to be the most stressful. A study was done by Debora Sibel et al. assessed the anxiety in women undergoing IVF treatment using state trait anxiety test (STAI) on 24 women undergoing IVF treatment in Brazil. The anxiety was checked at four levels; before the initiation of ovulatory agents, before egg retrieval, before embryo transfer, and on the day before the pregnancy result. The results of this study were unexpected as high baseline STAI-S and STAI-T scores were observed in all women except for two. A nonsignificant difference on SATI-S scores was seen at intervals of high anxiety during IVF which suggested that state anxiety does not change and remain elevated at all the intervals of the treatment. Another study by Mori et al. in 1997 was done in Japan on 102 infertile women undergoing IVF and embryo transfer. The anxiety of the subjects was measured using two scales; state-trait anxiety scale and manifest anxiety scale. Semi-structured interviews were also conducted to know the attitudes toward the treatment. The score of strait anxiety was found to be higher compared to general Japanese population. An article by create fertility clinics in 2015 mentioned that anxiety and stress is present in women during and after the treatment and the wait after the embryo transfer to hear the results is the most stressful part of the IVF procedure. This is one of the very few studies looking at stress in women undergoing IVF. Moreover, we have also studied anxiety and stress at three stages in IVF treatment to help us determine the kind of support the patient requires at each stage. To study perceived stress in women and evaluate the difference at all the three stages of treatment as well as analyze its interaction effect. The data comprised of 137 women undergoing IVF cycle. The data were collected from four IVF clinics of four different cities. Approximately 250 women were approached to be a part of the study. 239 women agreed to be a part of the study but only 137 could complete it. 59 cycles resulted into a freeze all cycle, 11 cycles were cancelled, no embryo transfer happened in 14 cycles, and 18 women either gave incomplete data or did not provide the data at all three stages. All couples with primary infertility undergoing their first or second IVF cycle. Couples with any preexisting psychopathology. The independent variable under study was the levels of treatment (T1, T2, and T3) whereas the dependent variables were state and trait anxiety as well as perceived stress in women. The tool used to measure the anxiety of the sample under study was state-trait anxiety inventory. It is developed by Spielberger, 1968, 1977. The scale consists of two forms; one is to analyze the state anxiety (Form X; a temporary condition experienced in specific situations) and the other is to measure the trait anxiety (Form Y; a general tendency to perceive situations as threatening). It has 20 statements in each part. It is a four-point Likert scale. Spielberger reported retest figures for Form X that ranged from 0.73 to 0.86 for trait scores, while state results ranged from 0.16 to 0.54. Content validity was assessed by Okun et al., who noted that the STAI covered five of eight domains for generalized anxiety disorder in the DSM-IV (Diagnostic and Statistical Manual for Mental Health). The other tool used was perceived stress scale (PSS). It measures the level of stress that the subjects perceive they have. It has total of 10 items and is a 5-point Likert scale. It is developed by Cohen et al. in 1988. Cohen et al. (1988) showed correlations with PSS and: stress measures, self-reported health and health services measures, health behavior measures, smoking status, and help-seeking behavior. The feasibility of the research topic was checked by conducting a pilot study on 3–4 couples from each clinic. For data collection, a rapport was first build with the women under study. Informed consent was taken by explaining them the purpose of the study. The data were collected in a quiet room of the hospital and its confidentiality was maintained for T1 and T2 stages. For T3 stage, data were collected through telephonic interview. The data was then scored using the standardized scoring pattern of the tools used. Statistical analysis was done at two levels; descriptive (means and standard deviation [SD]) and inferential levels (analysis of variance [ANOVA], Student's t-test and Levene's test). SPSS version 16 (Chicago, IL, USA) was used for the analysis. The descriptive analysis revealed that overt anxiety was highest at T3 level (mean = 45.77; SD = 12.838) followed by T1 level (mean = 44.23; SD = 12.049) and the least was observed at T2 level (mean = 43.04; SD = 12.240) [Table 1]. The state anxiety was more at all the three levels; T1 (mean = 46.11; SD = 14.81), T2 (mean = 44.74; SD = 14.66), and T3 (mean = 48.88; SD = 15.21) compared to trait anxiety; T1 (mean = 42.35; mean = 8.05), T2 (mean = 41.34; SD = 8.9), and T3 (mean = 42.66; mean = 8.95). It is also seen from the calculated means that the state as well as trait anxiety was maximum at T3 level followed by T1 and T2 [Table 2]. Perceived stress was observed to be elevated at T1 level (mean = 17.93; SD = 5.19) followed by T3 level (mean = 17.28; SD = 5.64) and T2 level (mean = 16.72; SD = 5.09) [Table 3]. To study the interaction effect of overall anxiety and perceived stress at all three levels, ANOVA was carried out, and the result obtained showed that a significant difference between all the three levels as far as anxiety is concerned (F = 3.35; P = 0.036) but no significant difference was found for perceived stress (F = 1.79; P = 0.169) [Table 4]. Student's t-test was used to evaluate the difference between state and trait anxiety at all the three levels and it revealed that there was a significant difference between state and trait anxiety at T1 level (t = 2.61; P = 0.01), T2 level (t = 2.31; P = 0.21), and T3 level (t = 4.12; P = 0.00). The Levene's test for equality of variances too showed a significant difference at all the three levels; T1 (F = 8.51; P = 0.004), T2 (F = 7.69; P = 0.006), and T3 (F = 5.97; P = 0.015) [Table 5]. A significant difference was only seen between the T1 and T2 levels as far as perceived stress is concerned (t = 1.95; P = 0.052). The difference in perceived stress between T2 and T3 (t = 0.87; P = 0.387) as well as between T1 and T3 (t = 0.99; P = 0.322) was statistically not significant. Even Levene's test was found to be not significant [Table 6]. As far as state anxiety is concerned, there was a significant difference observed only between T2 and T3 levels (t = 2.29; P = 0.23). The Levene's test for equality of variances was found to be not significant [Table 7]. The difference between T1 and T2 (t = 0.28; P = 0.781), T2 and T3 (t = 1.43; P = 0.155), and T1 and T3 (t = 1.11; P = 0.27) was not significant. The same was found for Levene's test for equality of variances too [Table 8]. Overall anxiety level was found to be high at all three levels of IVF treatment. At T1 level (day of start of stimulation), the patients were more anxious compared to T2 level (day of embryo transfer). The first-timers, who have never been through an injection phase before, get fearful on the day when they have to start with injections., For those slightly experienced, the memories of the past and apprehension of the upcoming phase of injections boost their anxiety. T1 is the day when they are taking a step forward toward fulfillment of their long-awaited dream and IVF is the last resort for them to have a baby. At T2 level, they have gone through most of the treatment procedure, and at that time, they are more familiar with the hospital, the doctor, and the supporting staff, so they become more confident about the treatment, which reduces their level of anxiety which is not the case at the time of T3. The change in state anxiety (a temporary condition experienced in specific situations) without any change in the trait anxiety (a general tendency to perceive situation as threatening) signifies that it was the treatment that made women more anxious. No change in the trait anxiety assured that the though the data were collected telephonically at T3 level, the accuracy of the research study was maintained as it was done without any biases or prejudices. This study revealed the overt as well as state and trait anxiety to be highest at T3 level. The period where the patient had to wait to know the pregnancy result after embryo transfer was the most difficult one for them. It makes them very anxious as there is a lot of uncertainty present. Women dream to be mothers and they are desperate to have a child, so waiting for the result is not easy for them. The level of stress, anxiety, and anticipation rises with each stage, peaking during the waiting period. The thoughts about “what if it does not work” make them nervous not only about their own hopes and the expectations but also of their family members and friends. During the waiting period, they are even worried about the money they have invested. One of the most difficult parts for women is to think for “good” answers to tell if the treatment did not work for them. The patients' perceived stress was found to be higher at T1 level as it was the day when they start the treatment followed by T3 level wherein they have to wait for the result. After trying all possible natural ways of pregnancy, the hope of them getting pregnant naturally like their other family and friends is now lost. They know that they will have to undergo the treatment and that they cannot do anything about it. Poor acceptance for treatment and lack of true knowledge of IVF in society are one of the main reasons for this. When enquired, getting into the treatment itself was not perceived as stressful as much as the factors that were associated with the treatment. These factors were both internal and external. These include the perception of loss of control over things, disclosure of their infertility, fear of judgments, resulting in anger and frustration, feeling of guilt and fear that they would not be able to give happiness to their husbands and their families. Women undergoing IVF treatment hold basic concerns such as getting a negative pregnancy test, disclosure of the treatment, and their problem of infertility itself. It can be concluded from the findings of the present study that anxiety and stress are present in women throughout the IVF procedure. They are most anxious during the waiting period and their anxiety levels (state anxiety) are higher compared to their general anxiety levels (trait anxiety). Perceived stress is observed to be more on the day of stimulation followed by the time when they have to wait for their pregnancy result. The present study focused on women undergoing IVF for the first or second time only. The results could be different in women undergoing repeat cycles. Other variables such as the socio economic strata, educational background, and primary or secondary infertility could also have been taken into consideration. Only questionnaire method was used for data collection; other methods such as interviews and focused group discussion could also have been included. The sample size of the study is not very large, so the results cannot be completely generalized. The other limitations are as follows: there is a lack of control group in the study and the data at T3 level is collected telephonically. This study gives an insight that proper medical and psychological counseling is required by a patient at all steps during the treatment and depending on the level of stress and anxiety tailormade counseling sessions should be designed for them. We would like to thank Jessicinta Coelho, Anushree Shah, Pushpa Raga, Mounika Mallu, Sowmya Goli, Anupma Kundu, and Mahasweta Nath for helping in data collection. Olofsson JI, Banker MR, Sjoblom LP. Quality management systems for your in vitro fertilization clinic's laboratory: Why bother? J Hum Reprod Sci 2013;6:3-8. Melbourne IVF, Leading Minds Dedicated to Your Success. Managing Stress and Anxiety through IVF Treatment; 2015. Available from: https://www.mivf.com.au/sites/mivf.com.au/files/leaflets/miv_6ppdl_stressanxiety_v1_pp_lr_webformat.pdf. [Last accessed on 2018 Mar 01]. Wichman CL, Ehlers SL, Wichman SE, Weaver AL, Coddington C. Comparison of multiple psychological distress measures between men and women preparing for in vitro fertilization. Fertil Steril 2011;95:717-21. Schaller MA, Griesinger G, Banz-Jansen C. Women show a higher level of anxiety during IVF treatment than men and hold different concerns: A cohort study. Arch Gynecol Obstet 2016;293:1137-45. Mahajan NN, Turnbull DA, Davies MJ, Jindal UN, Briggs NE, Taplin JE, et al. Changes in affect and state anxiety across an in vitro fertilization/intracytoplasmic sperm injection cycle. Fertil Steril 2010;93:517-26. Yong P, Martin C, Thong J. A comparison of psychological functioning in women at different stages of in vitro fertilization treatment using the mean affect adjective check list. J Assist Reprod Genet 2000;17:553-6. Debora S, Lobo DS, Motta EL, Kotecki JA, Fuentes D, Serafini PC. 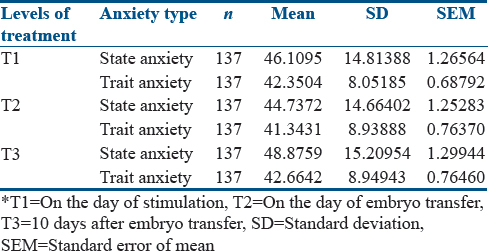 Assessment of anxiety in women undergoing in vitro fertilization (IVF) by the state-trait anxiety inventory (STAI). Fertility and Sterility 2003;80:242. Mori E, Nadaoka T, Morioka Y, Saito H. Anxiety of infertile women undergoing IVF-ET: Relation to the grief process. Gynecol Obstet Invest 1997;44:157-62. Createfertility-Pioneers of Natural and Mild Life. Stress during IVF Treatment; 2015. Available from: https://www.createhealth.org/news/2015/stress-during-ivf-treatment. [Last accessed on 2018 Mar 01]. Alex O, Stein RE, Bauman LJ, Silver EJ. Content validity of the Psychiatric Symptom Index, CES-depression Scale, and State-Trait Anxiety Inventory from the perspective of DSM-IV. Psychological reports 1996;79:1059-69. Cohen, S. Williamson G. Perceived Stress in a Probability Sample of the United States. In: Spacapan S, Oskamp S, editors. The Social Psychology of Health. Newbury Park, CA: Sage; 1988. Pistorius EN, Adang EM, Stalmeier PF, Braat DD, Kremer JA. Prospective patient and physician preferences for stimulation or no stimulation in IVF. Hum Fertil (Camb) 2006;9:209-16. Lintsen AM, Verhaak CM, Eijkemans MJ, Smeenk JM, Braat DD. Anxiety and depression have no influence on the cancellation and pregnancy rates of a first IVF or ICSI treatment. Hum Reprod 2009;24:1092-8. Lambert RD. Safety issues in assisted reproduction technology: The children of assisted reproduction confront the responsible conduct of assisted reproductive technologies. Hum Reprod 2002;17:3011-5. Convington S. Preparing for IVF: Emotional Consideration – An article by Sharon Covington. Shady Grove Fertility; 2007. Available from: https://www.shadygrovefertility.com/application/files/5714/9426/9655/4CPD8.07_Preparing_for_IVF. Emotional_Considerations. Sep07_Feb2017.pdf. [Last accessed on 2018 Feb 28]. Lancastle D, Boivin J. A feasibility study of a brief coping intervention (PRCI) for the waiting period before a pregnancy test during fertility treatment. Hum Reprod 2008;23:2299-307.